Got another Bruichladdich from the whisky exchange show back in October, bloody hell it’s gone quick. Older Bruichladdich’s are a bit of a funny one. I find that as Bruichladdich ages it tends to get more estery still taste young and fresh. But that’s in Bourbon barrels. This is the first I’ve tried from a Sherry cask, I think. Although, I thought Bourbon from the colour, so refill. 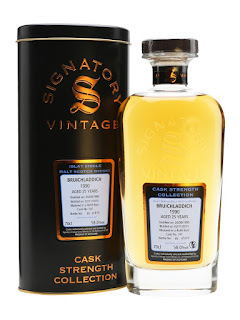 Shoutout to Signatory, all of their cask strength range they brought to the show were great. Nose: I was expecting lemon but instead this has a lovely light Sherry style, a light touch of dried fruit and bakery smells. Taste: Same on the palate, light Sherry, lovely style, bakery but not yeasty, like cinnamon rolls maybe. Finish: Medium/Long length. More spicy with pepper, Sherry and some tannins. Cask 141, bottled late 2015. This is great, really nice light touch of a refill Sherry cask. At 25 years old too, it’s got a nice complexity and balance. Would like to have a bottle of this and see more how it develops. Thanks for reading! Only a few left to go from the show.